Give your training a boost of confidence with this Armour® Low-Printed Bra for women. 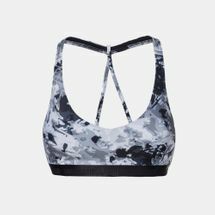 Designed for low-impact workouts and day-long comfort, its ultra-light HeatGear® fabric delivers superior coverage without added weight. A 4-way stretch construction allows for natural motion while retaining its shape. Stay dry with its Moisture Transport System, while anti-microbial technology keeps you fresh through your gym routine.